The World According to Chuck: The last time you were in my car, did you leave expired milk in the backseat? The last time you were in my car, did you leave expired milk in the backseat? This was a delightful little coming of tale essay that I wrote for my advanced literature class. This is just the draft, mind you, so the format has the potential to change before I turn it in next week, but it was met with much acclaim in class yesterday. a lot and most people during the critique said that they wouldn't change anything about it. This is why I am all smiles and sharing the essay. It feels good when your work has some nice things said about it. I can’t quite remember, but I’d assume that my first taste of a Philadelphia cheesesteak was out of the bottle after I barged my way into the world. You see, I grew up on the outskirts of Philadelphia where there were mainly only two things that mattered: no Philadelphia professional sports team went down in defeat and most importantly, you knew the correct way to order a cheesesteak. June 11th: Alexander the Great died, Vince Lombardi was born, Sir Barton became the first triple crown winner after winning the Belmont Stakes, and I had my very first cheesesteak at Veterans Stadium – the then home to the Philadelphia Phillies. It was 1999 and I was just an eleven year old boy spending the day with his father. Left-handed pitcher Randy Wolf was making his major league debut, and it was during the seventh inning stretch that my father and I headed towards the concession stand. I had eaten cheesesteaks tons of times before, but I had never been the one to bark out the order. Ordering a Philadelphia cheesesteak is an art form. Say the wrong words and you’ll get sent right to the back of the line. That’s no lie. 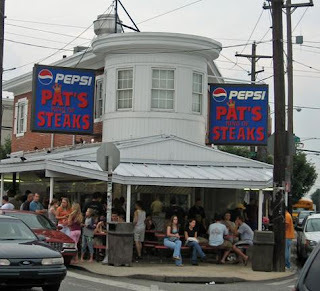 I’ve seen it happen to the tourists down at the legendary Pat’s off of Passyunk Ave. The rules are simple. Rule #1) Know what you want to order before you get to the cashier. Simple enough, right? Rule #2) Do not ever say the word cheesesteak when you are ordering. That’s grounds for immediately getting sent to the back of the line. You simply say the name of the cheese you want on your sandwich and the word “with” or “without” for whether or not you want grilled onions. Rule #3) Have your money ready! You’ve never seen such quick service and charmingly rude servers. I made sure to emphasize the “ wit’ “ so he would know that I was a local and not some ignorant tourist’s boorish son. I handed over the money and before I could get the change back there were already two beautiful cheesesteaks resting on the counter for our pleasure. I adjusted my bright red ball cap with the distinctive liberty bell and “P” on the front, and then I took a big greasy bite out of the fruit of my labor. It was a testament of my manhood. The Philadelphia Phillies beat the Toronto Blue Jays that day by a score of 8-4, and I became a true Philadelphian - entered into an elite culture of people amiable enough to boo Santa Clause and snooty about nothing - except their sandwiches.